Like everyone else I know,we were hooked to the television watching Masterchef Australlia whenever it was aired,even the recaps were not missed.It was with the same enthusiasm we watched the Indian version,but we were disappointed,we felt there was too much drama and it looked so scripted that we stopped watching after the first episode. Why I am mentioning Masterchef India here is because of the charming Michelin star chef who hosted the second season of the show which according to many was way better than the first season.I wasn't much familiar with the celebrity-chef,so I google'd.People Magazine named Khanna in the list of Sexiest Man Alive and also referred to as The Hottest Chef in the world.Khanna was awarded a Michelin star for his restaurant Junoon by Michelin Guide for 2012 and 2013. 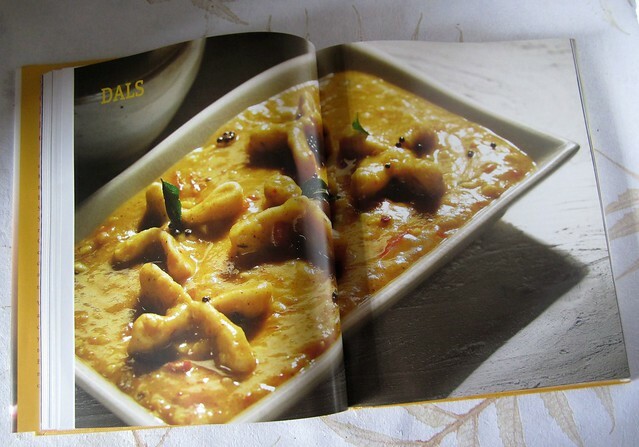 I received his latest cookbook My Great India Cookbook as part of a book review program by MySmartPrice,a price comparison engine that helps users find the best price for Books, Mobiles, Cameras and lots more. 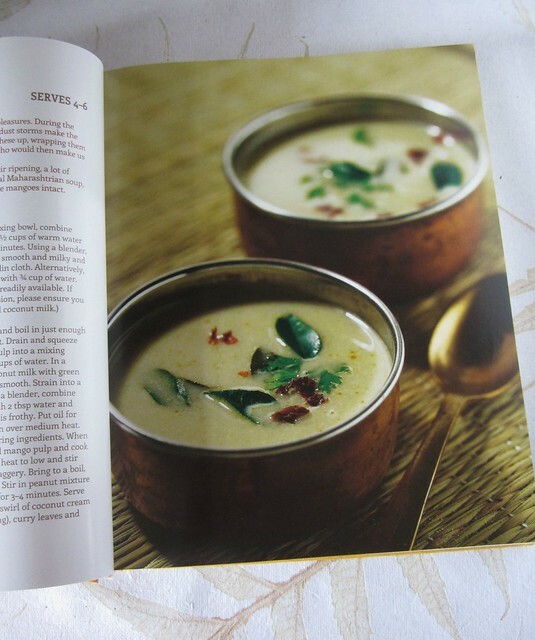 I love cookbooks which have pictures,and lots of them.Almost every recipe is accompanied by a gorgeous picture and you cannot expect anything lesser when the food styling and pictures are by Michael Swamy. The recipes are neatly indexed. 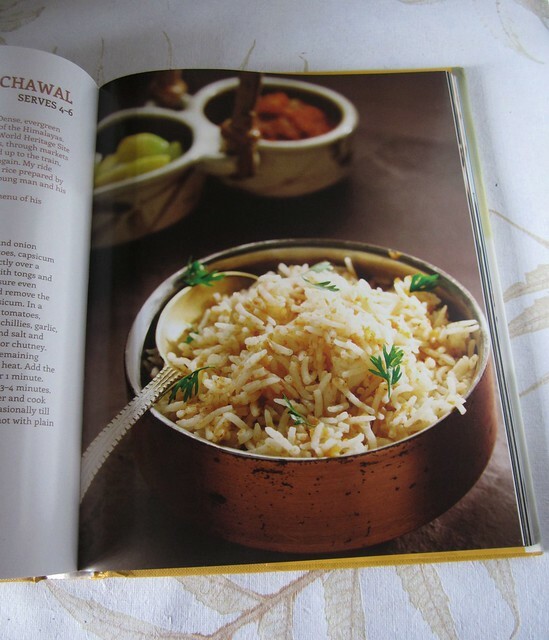 Soups,starters,vegetables,dals,fish&seafood,poultry,meats,rice,breads,chutneys&more,desserts&sweets.The book is named so for a reason and has recipes ranging from almost all Indian cuisines which the author collected on his travels through the length and breadth of India. Some recipes which caught my attention were Bylakuppe Thukpa,a Tibetan noodle soup made with a typical Tibetan masala called the kopan masala.Kerala special Pulisheri is made as a soup with cucumbers,which I am planning to try since we always have it as a side-dish.There is also a Kanji soup with fried fish.Raavan Bhaat,which has nothing to do with the mythological character but is named so because of the spice level in the recipe.Aloo achar,now that is something new,a pickle with potatoes? There are quite a number of Kerala and Konkani recipes which I must say made me very happy.Special mention goes to Karare Karele-spicy bittergourd chips,Kajuchi Usal-fresh cashewnuts in coconut,Fanasachi bhaaji-jackfruit curry,Goan Coconut rice,Kokum rice and many more. I loved the Dals and Rice sections as well with interesting recipes like Sultani Dal-Royal lentils which uses milk,cream and yogurt with toor dal and is given a smoked flavor with betel leaf.Bishambar's Rajmah,a recipe which is so simple and looks gorgeous.Tapeliya Dal Bhaat,a Gujarati rice recipe uses Dal and a spiced masala-definitely a must-try in my list,Kanika Bhog,a dish made in Marwar as an offering to the Gods. Khoba Roti,a patterned flatbread made in Rajasthan,too deserves a special mention,how can something look so pretty that eating it would make you feel cruel! The dessert section,though small is packed with variety.There is a Khubani ka Meetha from Hyderabad,Chena Poda from Orissa,Daulat ki Chaat from UP and Pithagurir Payas from Assam along with a few others. It was indeed a difficult choice for me too cook up something from this book as I was confused which one to try first.I haven't cooked much from other cuisines in India save for those so-called North Indian dishes,so I stuck with a recipe from my roots-Pacha pattani thoran,a simple side dish with green peas made in a Kerala style. 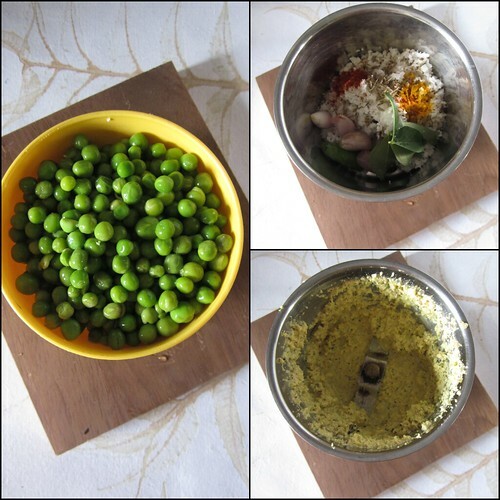 Blanch green peas in boiling hot water for 1 minute.I skipped this step as I was using frozen green peas which is already blanched. Make a smooth paste using the ingredients mentioned under the spice paste. 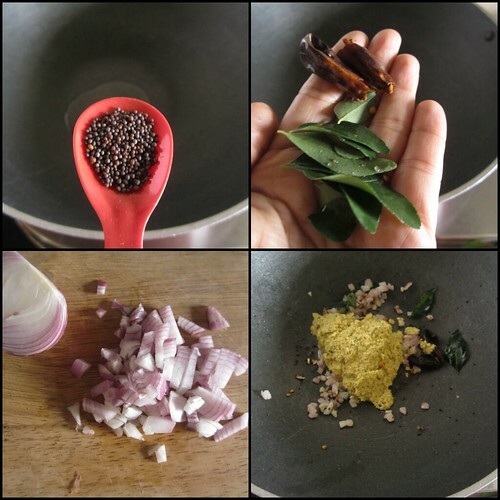 In a kadai add oil and splutter mustard seeds.Mix in curry leaves and red chilly bits and saute the onions till golden brown. 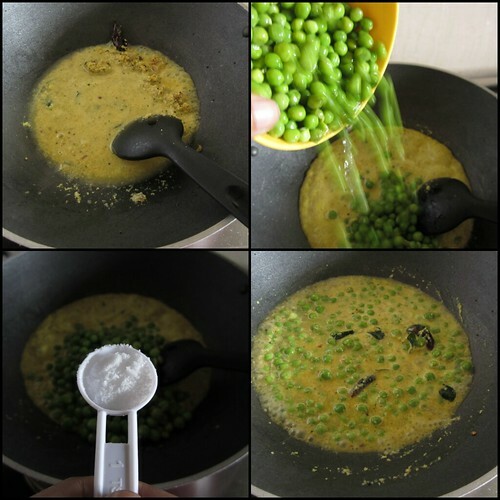 Add the spice paste and about 1- 1½ cups of water and salt to taste.Let it boil and then mix in the thawed and drained(or fresh)green peas.Close with a lid and let it cook till soft. 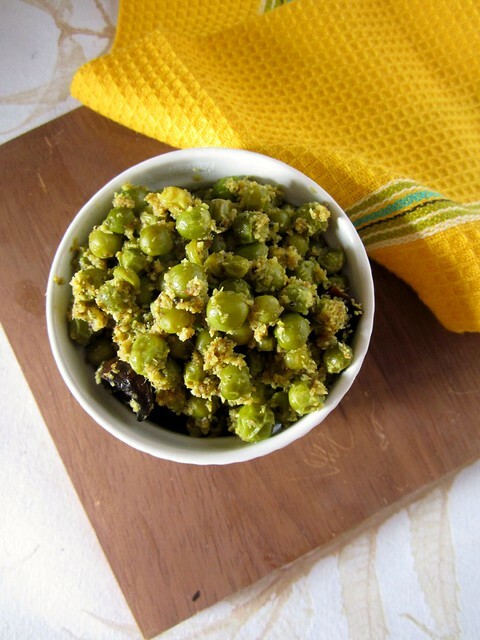 Serve with rice and rasam/sambhar. Looks yummy .....perfect chef,love his recipes. Oh wow. I saw the Masterchef only because of him, but there is too much drama. He is so down to earth, but I still agree that when you see him cooking, he looks so calm. Hottest and Coolest chef in the world. you know Divya I have so many cook books that I do not have place for one more and I had promised myself that no more cook books.But you have tempted me now.Thank you. Great book by the looks of it. Brilliant pictures. Very nice detailed review. Would love for more cookbook and food lovers to read this review and blog. 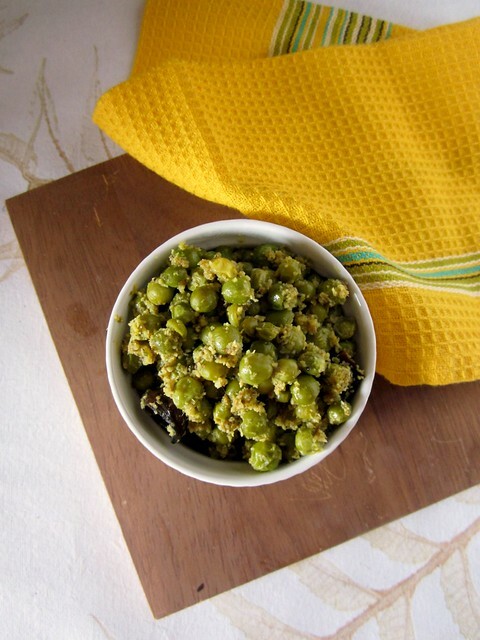 Therefore have added an excerpt and link to this review on cookbookQrator. Looking forward to many more great reviews. 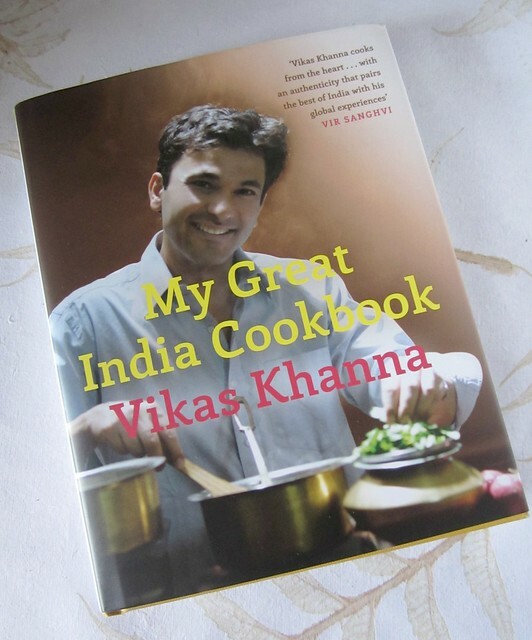 Hey Divya..I participated in Master Chef Season 2 and I made it to Top 50 Chefs..Met Vikas Khanna on the show and I must admit he is indeed a masterchef.. I wannna buy this book... Where can I get it ? ?